Encoding quality, encoding speed, bitarte handling, speed/quality analysis etc. (some graphs) Encoding quality, encoding speed, bitarte handling, speed/quality analysis etc. Hint: You can remove "Extended download" service while purchasing to save money. Pro version of comparison will be available immediately after report purchasing. The main goal of this report is the presentation of a comparative evaluation of the quality of new HEVC codecs and codecs of other standards using objective measures of assessment. The comparison was done using settings provided by the developers of each codec. Nevertheless, we required all presets to satisfy minimum speed requirement on the particular use case. The main task of the comparison is to analyze different encoders for the task of transcoding video—e.g., compressing video for personal use. The comparison was performed on Corei7 6700K (Skylake) @4Ghz, RAM 8GB, Windows8.1. For this platform we considered three key use cases with different speed requirements. Video sequences for all of MSU video codec comaprison reports were choosen by MSU team through manual selection. Various videos were selected to help to find the strengths and weaknesses of video encoders. This comparison’s test dataset was significantly updated. Our goal was to create dataset with videos that encoders are facing in everyday life. For this purpose 30000 videos from Vimeo service were analyzed and 885 4K videos with high bitrate were analyzed. 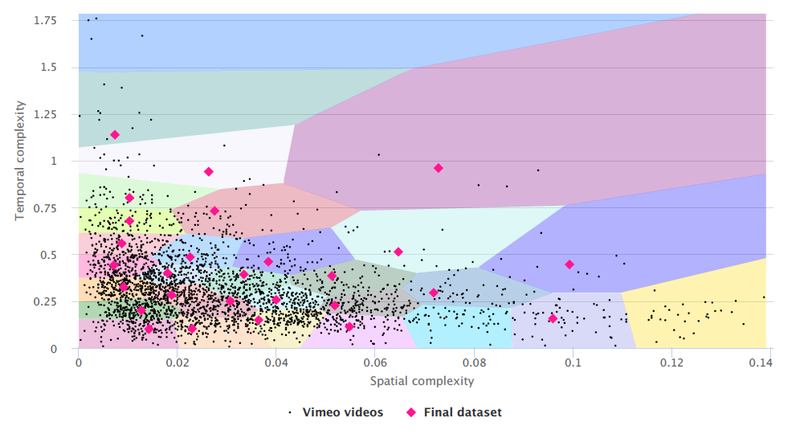 These videos were clusterized (by spatial and temporal complexity) and 27 video from the clusters were chosen. Chips&Media Inc. The Video Group would also like to thank these companies for their help and technical support during the tests. 11 years working in the area of video codec analysis and tuning using objective quality metrics and subjective comparisons. 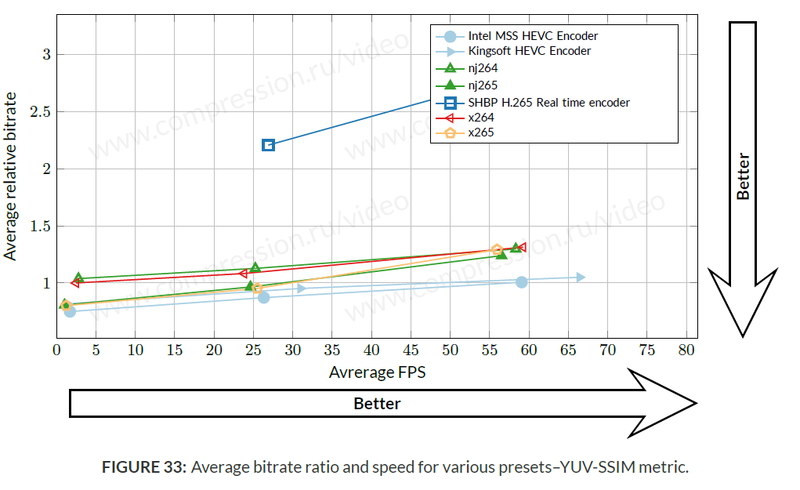 25+ reports of video codec comparisons and analysis (H.264, MPEG-4 MPEG-2, decoders’ error recovery). Methods and algorithms for codec comparison and analysis development, separate codec’s features and codec’s options analysis. We could perform next task for codec developers and codec users. Deep encoder parts analysis (ME, RC on GOP, mode decision, etc). Weak and strong points for your encoder and complete information about encoding quality on different content types. Encoding Quality improvement by the pre and post filtering (including technologies licensing). Comparative analysis of your encoder and other encoders. We have direct contact with many codec developers. You will know place of your encoder between other newest well-known encoders (compare encoding quality, speed, bitrate handling, etc.). 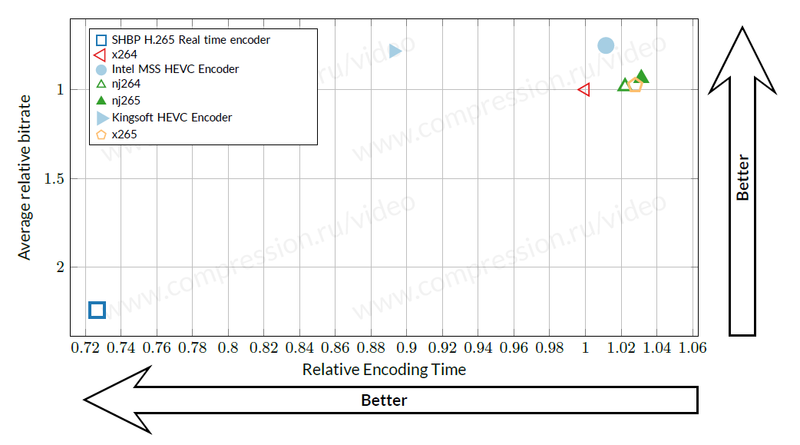 We perform encoder features effectiveness (speed/quality trade-off) analysis that could lead up to 30% increase in the speed/quality characteristics of your codec. We can help you to tune your codec and find best encoding parameters.